My last blockbuilding area in that day was wonderful place called Pļavnieki. It was right next to Purvciems and it turned out that this was a really wonderful place. I enjoyed that so much! These are the 250 pictures from there. That looks awesome! In the cross of Ilūkstes and Akademiķa M. Keldiša streets. That trolleybus looks really cool! That's one of the mos beautiful buildings in Latvia. I've seen them in other places too. I've never seen them in Estonia. People build shelters for cats in Latvia. She is watching two drunken men who saw me doing pictures of cat and started asking money from me. I just walked away, thankfully they didn't follow me. I went to the 9th floor of some building. And then I made same pictures from the 5th floor - the look is a bit different, I mean, the feeling is different. The same wonderful building again in a different place. 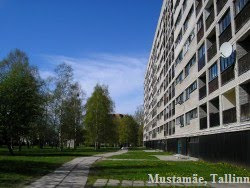 These buildings, very typical in Latvia, look very good, although they are weary. I wonder if these buildings are already built or not. That was one of the high moments in Rīga, in the edge of Pļavnieki. I like corridors like that. Huge corridors with concrete walls. I also enjoy corridors in nature, with walls of forest. This is so amazing! But still, I don't want to live in such a place where I can only see another building from my windows, no way! There must be openness and lots of sky visible, not just another building. The corridor from the ground. That's behind one of the walls of the corridor. My sweetheart, are you hungry? How suspective! But still cute! As it turned out, the corridor was unfinished in the soviet era so they finished it pretty recently. These buildings are so brand new that people still don't live inside. I got many abstract photos of them. Excellent architecture of landscape! Or, excellent monument! But I don't want to live here, unless it's very cheap. Oh, how beautiful! That outside the corridor. I think this is Purvciems. After having a long walk in the corridor area I came back to the place where I was before and walked in a different direction. Something very interesting caught my attention - neocommieblocks! Yes, here they are! I was so tired already that I just passed them briefly, but next year I came back to this area and got more pictures. Can you believe it - they build these buildings even today! Actually they do that also in Tallinn. But only in the areas where there already are buildings like that from soviet era. You are so soft and cute, you deserve much better life than this... You are so dear and lovely and I love you. Now some views from the Pļavnieki - first Dreiliņi. These buildings were the really first which I saw when I entered Rīga and I was so impressed! I think I visited this area more closely next year. So here are some far away zoomed in views of Dreiliņi. It is pretty much the edge of the city. That sould be Mežciems seen from Pļavnieki. I visited that area also next year.